I found this fabulous Pineapple Upside Down Cake Rum from Malibu a few weeks ago, and then over the weekend I decided I needed to bake something with it. I didn’t want to do a traditional style pineapple upside down cupcake. I LOVE the taste, but they are a sticky mess. 🙂 So I figured I’d stick the outsides back in, and top it off with a brown sugar buttercream. Every now and then, I feel like I have a brief moment of foodie genius. This was definitely one of those moments. These are ABSOLUTELY delicious, and would be perfect for one of those upcoming summer gatherings. Luau party anyone?? I don’t have time for all that. I want to bake, snap a few pics of my cupcakes and then sit on my couch and eat them. I am pretty sure you know what it looks like to throw some eggs, oil and cake mix in a bowl and then mix it up. Take your favorite yellow cake mix. Follow the directions on the box, except substitute the Pineapple Upside Down Cake Rum for the amount of water called for. If you want to make a booze-free version, you can sub pineapple juice for half of the amount of water called for. Bake the cupcakes according to the directions on your cake mix box. After the cupcakes have completely cooled, core the centers. You can use a cupcake plunger, or take a sharp knife and cut out a cone shape from the middle of the cupcake (you don’t NEED to put these bits back on after you fill the cupcakes, so feel free to eat them as you go!). After your cupcakes have been cored, spoon a small amount of pineapple topping (you can find this with the ice cream toppings) into the center of each cupcake, and then insert a maraschino cherry into each hole. After that, whip up a batch of this delicious Brown Sugar Buttercream Frosting from Two Sisters Crafting and have some fun decorating your cupcakes! I rolled mine in yellow sanding sugar, and then used some Wilton Christmas tree sprinkles as my “pineapple leaves”. I will post a picture of the most important step… Take a bite and enjoy!!! Hi everyone! Sorry I have been MIA for the past two months! In addition to this being the WORST winter weather-wise (seriously, 3rd snowiest winter in Philadelphia – I think I have spent half the past two months just shoveling my driveway! ), this has also been a very bad start to 2014 on a personal level. Hence, my disappearing act. Things are better now though, and with St. Patrick’s Day right around the corner I am hoping a bit of the Luck o’ the Irish will get everyone through the rest of this winter unscathed! In order to facilitate said luck, I made some Irish Potatoes and added an extra special ingredient – booze (I know, no surprise there right?)! Until last year when I shared my Drunken Irish Potato cocktail recipe, I had no idea that people outside of the Philadelphia area may have never experienced the sweet perfection of these little treats. So this year I am making it my mission to get everyone acquainted with my little spuddy buddy, the Irish Potato. In a medium bowl, beat together the butter and cream cheese until smooth. Add the liquor of your choice (or vanilla extract if you don’t want to use alcohol) and confectioners’ sugar, one cup at a time, beating until smooth. 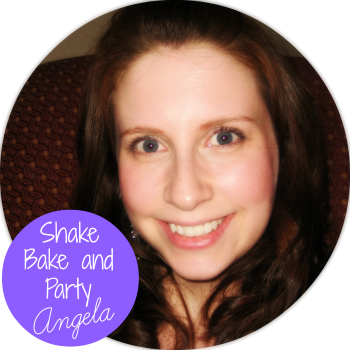 Mix in the coconut flakes – I used my hands! – and then chill the mixture for about 20 minutes in the refrigerator. Pour a few tablespoons of ground cinnamon into a small bowl. Once the mixture has chilled, roll into small balls or potato shapes and then coat in the cinnamon. Place onto a cookie sheet and chill to set. 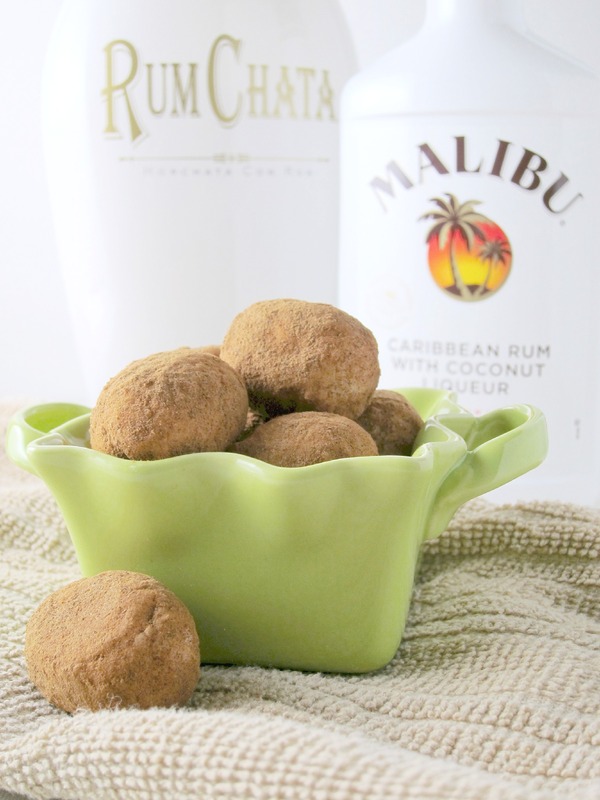 The addition of the coconut rum just enhances the coconut flavor in the Malibu potatoes, and the RumChata potatoes were slightly creamier with a hint of vanilla. 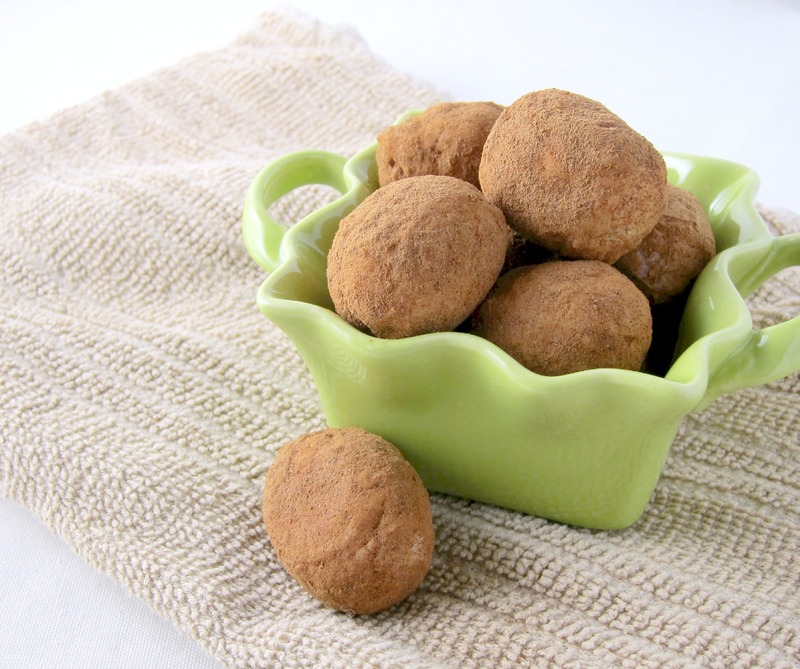 These aren’t overwhelmingly boozy the way rum balls at Christmastime can be. These are fun to make, and even more fun to eat! 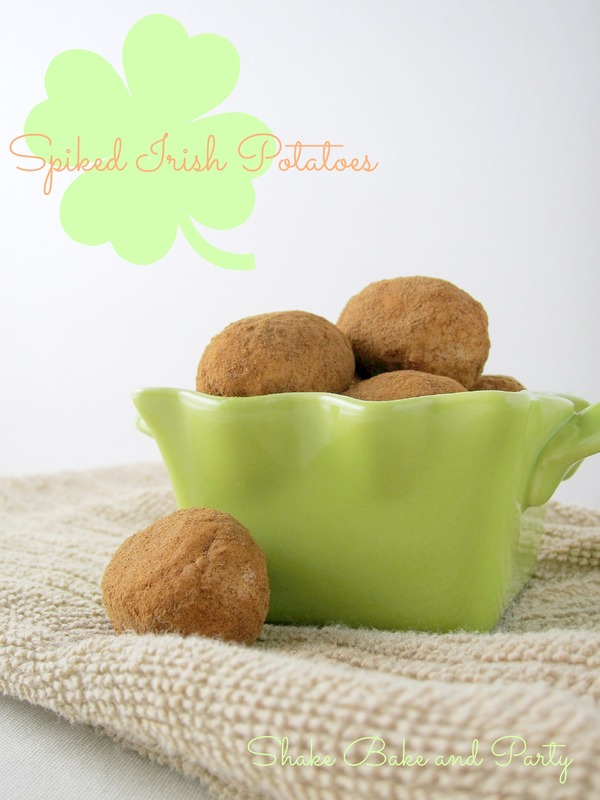 If you leave out the booze these are definitely an easy St. Patty’s Day treat that kids can help whip up; their little hands are perfect for shaping these bite sized spuds! If you have never had an Irish Potato before, give these a try and let me know what you think! I’d love to hear from any first-timers out there! If you agree that the combination of creamy coconut and cinnamon is as awesome as I think it is, try out my liquid version – the Drunken Irish Potato! Here we are folks, Monday AGAIN. Another weekend has passed by all too quickly and another week looms long on the horizon. Right now you are probably saying to yourself, Monday mornings are bad enough without this chick bringing me down. What gives? I give! I give you this! That’s right – I am turning Mondays around! Okay, well maybe just this Monday but it’s a start, right? 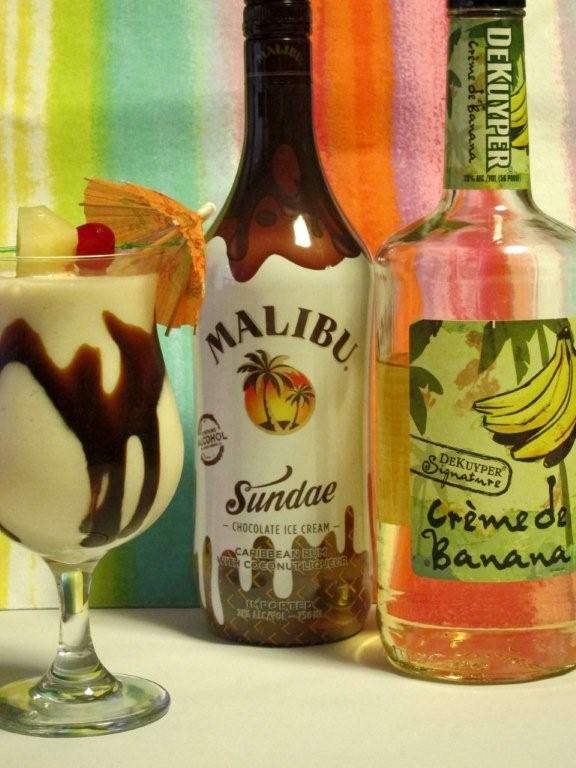 One day a few weeks ago, while perusing Malibu Rum’s Facebook page, I discovered the existence of Malibu Sundae. Chocolate ice cream, coconut, rum… This sounded SO GOOD that I had to have it! I hit my usual liquor store which has a huge selection of pretty much everything. They did not have this. Neither did any of the other liquor stores within a 15 mile radius of my house. I know this because I called them all. I finally found it on the website for a nearby liquor store. They didn’t have it in-store but I could special order it through their site. And then it arrived. And it was good. It’s delicious by itself, straight out of the bottle. It’s awesome mixed with Baileys Caramel and half & half. 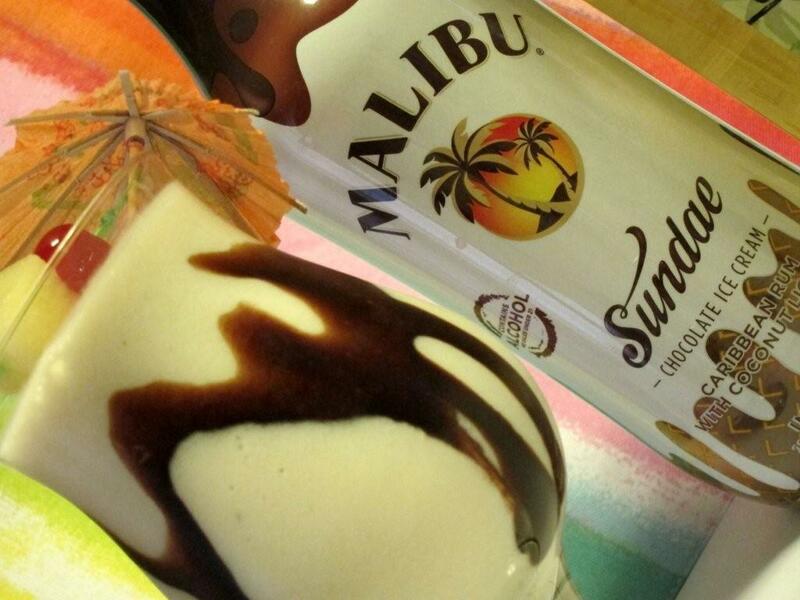 It’s AMAZING in my Tropical Sundae Cocktail! Combine all ingredients except the garnish ingredients in a blender and blend. 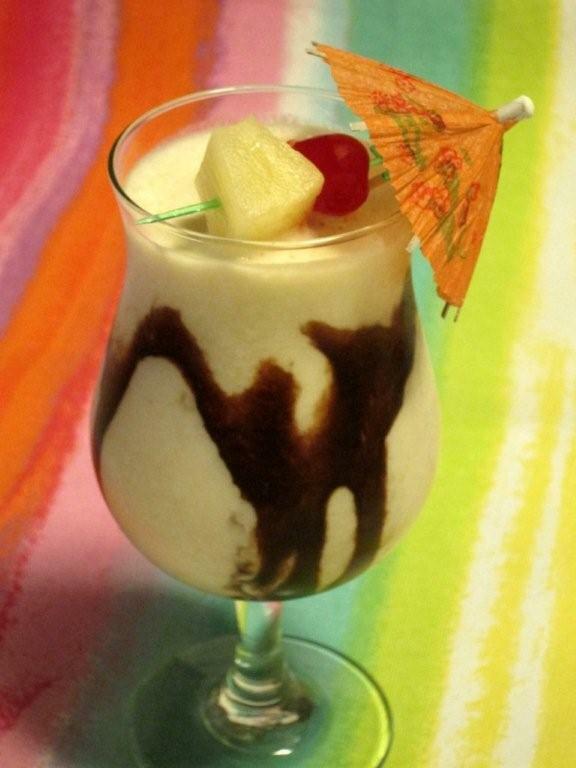 Swirl chocolate syrup inside the glass, pour and enjoy! Adding a hokey cocktail umbrella ups the cheer factor – especially helpful after another soul-crushing Monday at work.